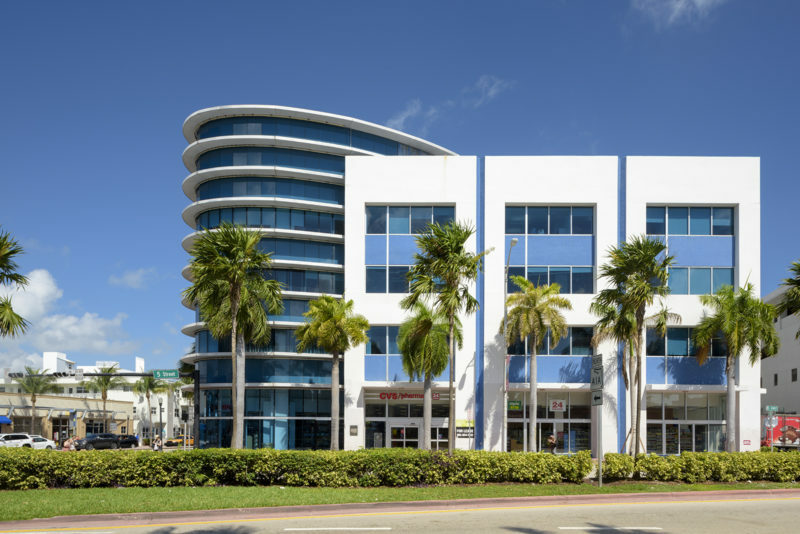 Designed by famed Miami-based architecture firm Arquitectonica, 555 Washington Avenue is a boutique mixed-used project on Miami Beach consisting of 46,000 square feet of Class A office, 22,000 square feet of street-level retail, and a 243 space attached parking garage. Situated at the corner of Washington Avenue and Fifth Street, 555 Washington provides unparalleled access from the mainland via the Macarthur Causeway and unmatched proximity to the luxurious South of Fifth neighborhood, where many of Miami Beach’s decision makers reside. The Property’s curb appeal is accentuated by its signature illuminated elliptical glass corner and a dramatic 80-foot open atrium glass lobby. Washington Avenue is currently undergoing a revitalization with major retail and hotel developments that will significantly improve the surrounding area. East End plans improve the facade and streetscape, as well as implement a creative pre-built office program. 555 Washington offers an upscale business environment that caters to the creative and innovative companies who embody Miami Beach’s vibrant flair.